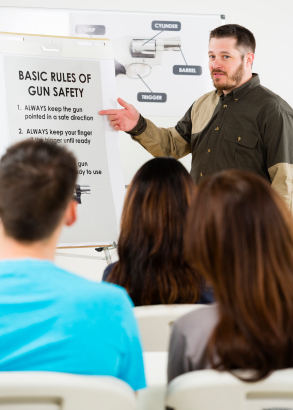 Due to changes in the curriculum from the NRA, we will no longer be offiering this course. We do not agree with the idea of having new shooters learning on the internet instead of with a competent, qualified instructor, and as such we will no longer provide this course as an option in our training catalog. More Details: This course is at least 8-hours long and includes classroom and range time learning to shoot revolvers and semi-automatic pistols. Students learn NRA’s rules for safe gun handling; pistol parts and operation; ammunition; shooting fundamentals; range rules; shooting from the bench rest position, and two handed standing positions; cleaning the pistol; and continued opportunities for skill development. Students will receive the NRA Guide to the Basics of Pistol Shooting handbook, NRA Gun Safety Rules brochure, Winchester/NRA Marksmanship Qualification booklet, take a Basics of Pistol Shooting Student Examination, course completion wallet certificate, and course completion certificate. Student will also receive personal one-on-one instruction with certified instructor to demonstrate their abilities in safely and proficiently operating a handgun. Video of personalized instruction is available upon request, additional instructor-specific resources, range time, ammunition, and use of firearm is all included in the price of the course. Pizza will be provided for the students for lunch, or each participant may bring their own lunch. Class Limit: Strict Limit of slots available. This is to ensure that each student can spend ample time with the instructor in a one-on-one basis as well provide sufficient time for questions and answers. We want you to retain what you learn, not be one of a dozen students. More Details: This is an eight-hour course. Students should expect to shoot approximately 100 rounds of ammunition. Students will learn basic defensive shooting skills, strategies for home safety and responding to a violent confrontation, firearms and the law, how to choose a handgun for self-defense, and continued opportunities for skill development. Students will receive the NRA Guide to the Basics of Personal Protection In The Home handbook, NRA Gun Safety Rules brochure, the Winchester/NRA Marksmanship Qualification booklet, and course completion certificate. Make an investment in yourself by registering for this class. This will be a fun class where you will increase your level of confidence and understanding regarding the operations of a handgun. If you have any questions regarding this course, please feel free to Contact Richard directly.